See the details on this page on aa.com. AAdvantage miles awards on China Southern do not show on aa.com. Awards must be secured by calling American. No telephone charges are made for awards that can not be secured online. Member stephem has shared CZ award fare buckets include: F First; O Busines, S Premium Economy (for when AA makes PE available on other than AA) and X Economy. These can be searched for using ExpertFlyer. NOTE: As awards using CZ are very new, you may encounter AA agents who are unaware AAdvantage miles can be used to secure awards on China Southern Airlines. As of 20 March 2019, AAdvantage members may use AAdvantage miles to secure MileSAAver awards on non-oneworld airline partner China Southern Airlines. Very nice. Too bad first class award is not available now. Just got off the phone with an agent and they didn't even know about it Not a lot of dates available, according to them. 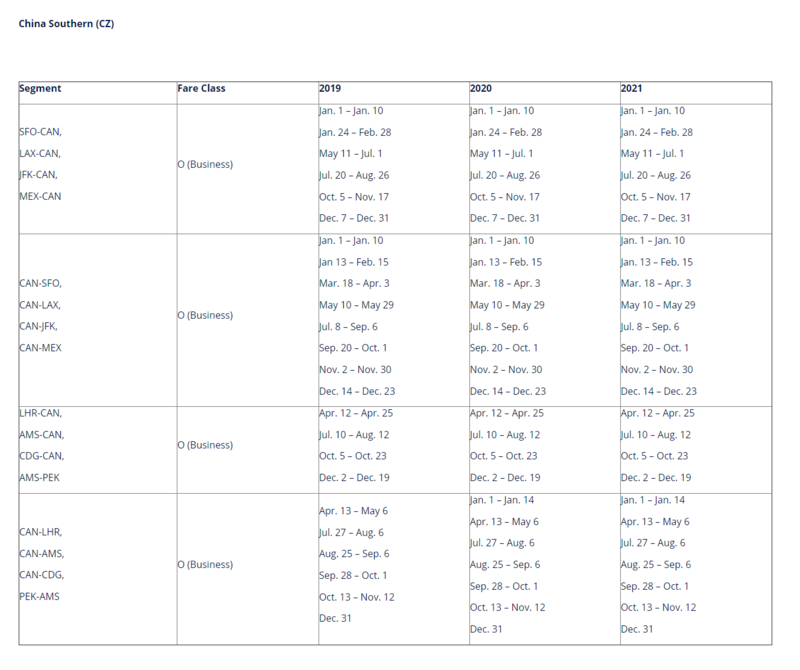 What we have to learn (and add to the Wiki) is what the award fare classes are and where we can find the award seat availability reported. CZ awards can be seen on ExpertFlyer, but as with all awards we will get the information. Kind of like for Etihad calling Fiji, etc. And with this rolling out today, I expect some AAgents may not be aware, not know how to search, or even to care and just feed us stuff like “you can’t, they’re not part of oneworld” and the like. It looks like CZ uses the following buckets for awards X- eco, O-biz and F-first. When I collected DL miles a while back I had some good luck finding multiple (sometimes as many as 5) biz seats on the A380 LAX-CAN flight. But I did some quick searches now and dont see that to be the case any longer. It is Business Class awards not available for the rest of the year from the USA? And, irony of ironies, CZ awards are still available with Delta miles. LAX-CAN in coach comes with a $104 carried-imposed surcharge with DL miles at the moment. My random check of J award availability from SFO, LAX and JFK also returned a bunch of donuts. I don't know if AAdvantage will implement CZ blackout dates the same way Delta has but one might consider it when checking for award availability. Try to book lax-can-syx in September in business. searched using CZ sky pearl program, wide open availability every day. called AA, talked with a few agents, no seats available at all each day in September even for the lax-can segment. The agent did find one coach seat available on one day though, and she seems need to request CZ to release that seat to her, which takes only a few minutes.